Cloudy with occasional showers overnight. Low near 40F. Winds WNW at 5 to 10 mph. Chance of rain 40%..
Cloudy with occasional showers overnight. Low near 40F. Winds WNW at 5 to 10 mph. Chance of rain 40%. The first of three 2019 Disney animation-to-live-action remakes (“Aladdin” and “The Lion King” being the others), “Dumbo” will also likely be its least successful both at the box office and with critics. This isn’t surprising since the original from 1941 hasn’t aged well and is regarded by many Disneyphiles as one of the weakest in the studio’s entire catalogue. At 64 minutes, it’s the studio’s shortest animated theatrical feature and included a character named Jim Crow, which, not surprisingly, fostered numerous negative ethnic stereotypes, and a title character who received his name from not being smart. Not quite twice as long as the original, director Tim Burton’s true “re-imagining” — apart from its circus setting and parent-child central theme — bears little resemblance to the 1941 film. Unless you’re a stalwart and entrenched purist, this is good news. The story is set in 1917, and Burton and his technical crew wisely resisted the temptation to top load it with too many modern bells and whistles and dedicated the lion’s share of their CGI budget to creating gorgeous life-like animals, which, thank goodness, don’t talk. Rounding out the good news portion of the program is the inclusion of two impossibly adorable children and Eva Green playing the only interesting human character (a French trapeze artist named Colette). Given Burton’s past resume of making the macabre audience-friendly, profitable and respected, “Dumbo” is particularly disappointing since it bears none of his unique stamps. There is no uneasy humor, no oddball characters and no sense of real danger. This generic, rote and blueprint movie could have been directed by anyone. It might not be Burton’s weakest effort, but it is easily his least innovative. Based on recent interviews, it’s understandable why Burton might have taken the gig. Although he’s not a circus fan, he’s likened the bond of circus folk to that of families, and so many of Burton’s past films were family-centric. “Beetlejuice,” “Big Fish,” “Charlie and the Chocolate Factory,” “Dark Shadows” and the 2016 criminally underrated “Miss Peregrine’s Home for Peculiar Children” (also starring Green) were all riffs on unconventional families that fit in perfectly with Burton’s angular sensibilities. Screenwriter/co-producer Ehren Kruger (“Reindeer Games,” three of the “Transformers” flicks) chooses the path of least narrative resistance with a story that could’ve been cobbled together by a fifth-grader. Traveling circus owner/ringmaster Max (Danny DeVito) is all energy and no foresight who is trying to keep his business afloat on the cheap. His troupe contains all of the typical attractions (strong man, snake charmer, oddly talented women) but can’t get enough people to buy tickets. He takes a chance by buying a pregnant elephant in the hopes her calf will generate buzz but is too myopic when this offspring emerges with oversized ears. His next move is to sell the mother and turn the son into a de facto clown. At the same time, war veteran, former horseman and widower Holt (Colin Farrell) returns home from the World War I battlefields minus an arm and the total inability to relate to his son, Joe (the cute but largely uninteresting Finley Hobbins), and daughter, Milly (Nico Parker — child of actress Thandie Newton and director Oliver Parker). A budding scientist with pluck and dare, Milly quickly bonds with the elephant child and realizes his oversized ears will lead to bigger and better things. How he comes to be called Dumbo is different than in the original but is no less insensitive. After word spreads that Dumbo can fly, New York circus magnate V.A. Vandevere (Michael Keaton) shows up in a limo, waves lofty promises and cash in Max’s face and absconds with the gifted pachyderm. Starting out fey with a tad of Andy Warhol and looking a bit like Dr. Strangelove, Keaton’s Vandevere eventually lands in “The Wizard of Oz” title character territory, replete with unbridled amounts of hysteria and megalomania. It’s a far cry from Keaton’s indelible sick puppy title performance in “Beetlejuice” or even his so-so turns in Burton’s two “Batman” flicks (one of which included DeVito as the Penguin). 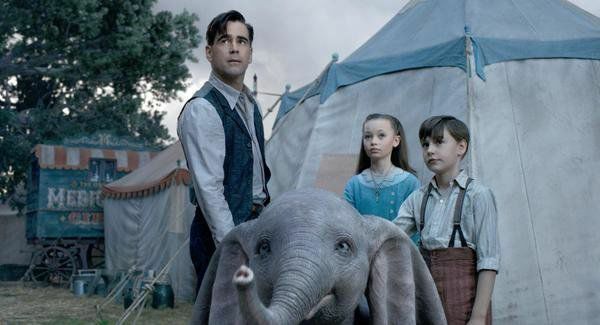 The trusted Disney brand (and a lack of new release box office competition this weekend) is going to be the primary reason why families will plunk down bucks for “Dumbo.” They — along with Burton’s core faithful — will probably make “Dumbo” a profitable venture. The saddest part of all of this is the inability to recommend the original film as an alternative since it is even worse for many different reasons. The final 10 minutes of the movie find the filmmakers making a rather slanted political statement, which — without giving anything away — is akin to a relatively recent event that led to the eventual demise of Ringling Brothers and Barnum & Bailey Circus, which oddly enough staged its first shows at about the same time “Dumbo” is set.